Long darn flight. The guy beside me was larger than me and is always ½ ways in my seat. I would complain, but he is not doing anything on purpose. I finally arrived in Windhoek. Even though I had the airline check on my baggage in Johannesburg to make sure it got to Windhoek only my guns showed up. This is not too bad except for the fact that my ammunition is in my clothes bag. I had a very pleasant ride to camp with Vera. We hit it off immediately and in a short while it seems as if we have known each other for a long time. The 3 hour ride to camp goes by quickly and just after dark I get my first look at camp. Johann’s parents, Clarissa and Vellies, are waiting and make me feel right at home. Vellies has a big bonfire and a glass of excellent sherry waiting for me. This is good because due to the fact that part of my luggage is missing I only have a short sleeve shirt and the temperature has already dropped into the 40’s. Vellies soon takes pity on me and loans me his extra jacket for the evening. Clarissa has made Bobotie for dinner. It is a spicy sweet minced meat pie made with kudu and gemsbok. There is an excellent South African red wine that complements the bobotie and dinner is just a wonderful experience. After dinner we return to the fire pit for stories and to get to know each other a little better. It has been a very long day (36 hours travel time) and soon I am ready to get some rest. Vellies shows me to my tent and I am immediately impressed with how well furnished and comfortable it looks. It’s cold outside but as I lay here under the covers writing these last few words of the day I am plenty warm and comfortable. I sleep till about 8 am and get up to a crisp African morning. It is about 38-40 degrees and I decide to brave a shower. The water is plenty hot and the tent heats up quickly. The shower is wonderful and I take a long time. It is worth it to be able to get 2 days worth of travel grime off of me. I make it to the dining tent and Vera tells me that Johann and my luggage are both on the way. Vellies has volunteered to take the laptop to his house to send my e-mail and wait for my luggage. Johann shows up soon and right behind him Vellies arrives with my lost luggage. Hoorah and all is well with the world. Vellies and Clarissa must be off and I bid them farewell while Vera prepares breakfast. Vera fixed a killer breakfast of bacon, sausage, eggs and toast. I eat way too much. I finally get a chance to talk with Johann during breakfast. He is trying to thaw out after a 300 km ride in an open safari vehicle. He and Tjokkie (his tracker and spotter) have been helping another Professional Hunter (PH). After all of the time I spent on the scope on the Mauser it got knocked loose again on the flight over. The Weatherby is fine so it will be the rifle I use during the trip. The Weatherby would have been my rifle of choice to use anyway, but I would have loved to take an animal with the Mauser. I am anxious to see the bush so we set off in search of game. We see some of everything on my list, kudu, gemsbok, and warthog, but none are shooters A few minutes before sunset we see a steenbok. It is the smallest animal on my list and the one I cared least about taking. Johann however says that it is a really good one and that I should shoot it. So I take aim and harvest my first African game animal. It is a little more complicated then that. I first had to figure out if Johann was saying shoot for the back, or shoot farther back. I finally figured out that he said farther back, so that is where I shot. 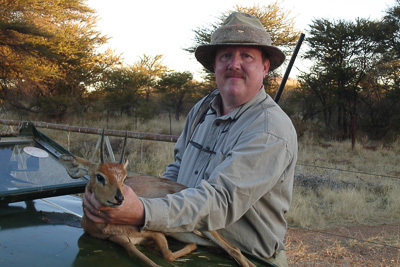 It turned out that this was a really, really, good steenbok; one that should qualify for a Gold Metal rating from the Namibian Professional Hunting Association. Johann says that it is the best one he has seen all year. The moment ends with pictures, smiles, and handshakes all around. After I have time to think about it I am pleased with myself. I made a difficult but short shot into the sun without getting buck fever. Before supper I get to take a better look @ camp. I particularly like the fire pit area. It is enclosed with a 6′ high reed/thatch fence with a raised fire pit in the centre. Along one wall is some concrete cabinet/counter top for cooking and food preparation. At one end is a wood cook stove that is still used a lot. Johann is going to cook Zebra steaks for supper. He takes several shovels full of coals from the fire pit and spreads them on the counter top. He places a trivet and grill on top then proceeds to cook the steaks to a perfect rare. We have the steaks with red wine, potatoes, grilled mushrooms and onions, and salad. For dessert Vera has made a cooked fruit salad served in pastry shells. Everything is excellent and I am soon stuffed to the point that I can hardly waddle to the fire pit. After we reach the fire pit I have another glass of wine and we relive the events of the day so that they become permanently etched into my brain. The day was so good that I don’t want to forget anything. Up @ 5:30, breakfast @ 6:00. I had something that I have not had before, cereal with hot milk. It surprised me and was very good. It was a granola type cereal and the hot milk helped to get your body warm on a cold morning. Soon we are off in the truck and boy is it cold with no top and the windshield down. I don’t know how cold it got last night but the water in the birdbath outside my tent was frozen when I came outside. We see lots of game, but none are good enough to shoot. I do get my first two stalks under my belt. It is really thick with short scrub and lots of thorn bushes. The African adventure writers I have read were right about this being thick country. I thought that stalking was just sneaking around through the brush, but it is much more than that. Johann and Tjokkie taught me about keeping the wind in your face and about sneaking around other animals while keeping the wind out of their face as well, all while not getting to close to any of the above. Not as simple as it sounds, is it? Johann and Tjokkie have no trouble seeing the animals even at great distances. I have problems seeing them even with binoculars. After a morning of non-shooters we decide to switch areas and see if that will change our luck. Monster Kudu!! We finally see a shooter and start the stalk. I eventually get into position and realize why they call the kudu the “Grey Ghost”; I am barely 75 yards away, looking thru a scope and can hardly see him. The animal blends in so well that if it were not for the markings on his face he would be invisible in his surroundings. I get into position and rest the rifle on the shooting sticks and prepare for the shot of a lifetime. I wait for the shot and wait and wait and nothing. This critter just won’t move. It is as if he knows I can’t get a clean shot if he does not move. I have always refused to take a shot thru the brush and even though it crosses my mind I decide not to take it. After a standoff that seems to last for a half hour (probably only 5 minutes) he tucks his head and disappears. We take off after him and stalk for approximately ½ mile, but we can’t get into position for a shot. It is close to lunch so we decide to check a few water holes on the way back. The wind is blowing the wrong way (of course) for an easy stalk to the waterhole so we strike off thru the bush. On the way to the waterhole we spot a warthog heading straight toward us. Johann sets the sticks and as soon as I get the rifle up and steady the rascal heads the other way. The only thing I can see is the critter’s rear end. I have always been told that this is a low percentage shot (on white tail deer) so I don’t take it. After I watch it walk off Johann ask why I did not shoot and I explain my logic. Then he tells me that warthogs are fairly easy to kill and that a solid hit pretty much anywhere would have been fatal. Oh well, live and learn. On the way back from lunch we decide to climb a mountain and glass for a while. Hopefully we would see something and have a starting point after lunch. The mountain was an interesting experience. We were able to take the Toyota most of the way up and I thought I had it made. Boy was I wrong. The top of the mountain was made up of boulders, some were solid and some were not. The trick was to figure out which was which. I had to use both hands and with a rifle this was not easy. I finally made it to the top, only marginally slower than Johann and Tjokkie and we started to glass. I said we, but Johann and Tjokkie were the only ones who knew what they were looking at. I reaffirmed right then and there that I still have much to learn. Johann thinks that he sees a good bull but at a couple of miles away it is hard to tell for sure. The problem is that the wind is still blowing the wrong way and we have to circle around. We take off down the mountain and it was no easier going down than going up. The grass there grows thick and covers up some of the rocks. So you slide on the grass till you hit a boulder, then sometimes it moves and sometimes it doesn’t. This is where the fun starts; anyway it makes for an interesting descent. I finally make it back to the truck and we’re off. This ride is better than anything that I rode at Disney two weeks ago. We finally make it to where we want to start the last stalk of the day. We tiptoe thru the bush to where the big bull is supposed to be, but he had other ideas. He had already left for other parts when we got there. With the light all but gone we sit and watch the rest of the herd graze and walk past us. One interesting thing about kudu, they flag their tails like white tail deer do. After last light we head for the truck and we decide to start here in the morning to see if the big bull starts his day at the same waterhole that he ended his day with. Back at camp I am getting used to the campfire/dinner routine. I take a few minutes to change out of my hunting clothes and put on some more comfortable ones. Then it is off to the fire pit where there is a glass of my favourite libation waiting on me. As I enjoyed my drink and good conversation around the fire Vera brought out the appetizers. They were chunks of bananas wrapped with bacon, grilled and then drizzled with chutney. That sounded completely foreign to me but, “when in Rome” so I tried one. They were absolutely delicious. I then proceeded to have another beverage and a whole skewer of the bacon wrapped bananas. After I finished my drink and the appetizers, we moved into the dining tent for kudu stroganoff with wild rice and baked squash. It was all very good. After dinner I returned to the fire pit with a glass of wine to sit and relax a while. Johann soon joined me and we started planning tomorrow. Just as we were finishing our planning session Vera brought out desert. I was just about too full to eat anything else but this was cobbler. I have had a weakness for cobbler ever since I was a small child. I can remember the smell of cobbler cooking on my grandmother’s wood stove like it was yesterday. When Vera informed me that it was orange cobbler I just had to have some. While we enjoyed our dessert around the fire I got to know Johann, Vera, and Zoë, their 1 ½ year old daughter, better. I learned that Johann had food allergies, as does my wife, and that they have a house at the coast during the off season. I also learned that they prefer the bush to the coast. I think I’ll fit in here just fine. One interesting thing, while we were talking around the fire we saw the brightest shooting star that I have ever seen. I do not know if it was the lack of artificial light in the bush or if the star was just low in the atmosphere but the trail of sparks was spectacular. After a show like that I figured it would be hard to top that so I excused myself for a shower and some sleep. What a day, what a day, what a day! The morning started off slow. Johann, Tjokkie and I watched the waterhole for hours to see if the big kudu bull from yesterday showed up, but it was not to be. Then we went looking for other animals, but the wind kept shifting and we were unsuccessful. We came back for an early lunch and a short nap before starting out again. We left a little early to check some waterholes and look for gemsbok. We had not been gone for ten minutes when we saw one, started our stalk, but once again the wind spoiled us. We decided to walk the rest of the way to the waterhole just to see what we could see. Before we get all of the way there Johann sees a huge warthog, we set the shooting sticks and I get ready. But as soon as I get into position he darts behind a tree and some brush. I am afraid that the wind has spoiled us again, but a few seconds later he pops back out and I get him in my sights. He is moving and I have to shoot thru a fence. I normally would pass up a shot like that, but this is a really good warthog. I concentrate on follow through and squeeze off a shot. It is perfect; I roll him with a shot to the spine. Some how I have kept the lead and missed the fence, I guess the pre-trip shooting practice paid off. When I get close enough to see him clearly he is magnificent. The tusks are right at 12″, good enough to be my second gold medal animal. We put him on the truck and go back to camp. We barely get him unloaded when Johann ask if I am ready to go back out. I am still too excited to think clearly and I agree to go, so it’s back into the truck and we are off again. Johann tells me that he wants to try one more waterhole before dark. Thank goodness it is a little ways off so I have a chance to regain my composure. We park the truck, Tjokkie checks the wind and we disappear into the brush. The brush is thick and I really have to pay attention to where I place my feet so that I don’t make any noise or trip. This is good because I am able to place the events of the past hour out of my mind. As we approach the waterhole, Johann and Tjokkie are a short distance in front of me. Johann slowly pokes his head up over the berm of the waterhole. He drops back down very quickly with a strange smile on his face and becomes very animated trying to get me to close ranks. Just across the waterhole is a very good kudu that is completely unaware of us. Tjokkie sets the sticks and I get into place. I am able to slowly raise the rifle and the sticks by pushing forward. The front two legs pivot up while the third falls into place from behind. I have pulled my camouflaged hat down over my face as far as I can and apparently the rest of my camouflage is doing its job because the kudu does not see me. I get to look at him for a few seconds and decide he is perfect. I can tell he is not huge but he is old and grey. The kudu I want to take is one that fits their nick-name, the “Grey Ghost” and this one could not be more perfect. He is almost directly facing me so I take aim a little low and in the center of his chest. Just as I pull the trigger he starts to drop his head and he keeps on falling forward into a neat little pile. Johann had warned me that if an animal goes down with the first shot that he might get right back up, so I rack another round into the chamber and get ready. A few seconds later Johann taps me on the shoulder and tells me that is over. The 300 Weatherby does the job again. It is amazing how that the three times that I shot the 300 at an animal that I have yet to feel it go off. But I don’t have time to think about this too long; I have a kudu to go look at. Closer inspection confirms that he is exactly what I want. He is old with two full curls and the tips are worn down from years of fighting and life in general. He is the epitome of the “Grey Ghost”. By now my adrenaline is sky high. I have taken two trophy animals in just over two hours. Due to Johann and Tjokkie’s knowledge and skill I have done what to me seems impossible in a single afternoon. We all are so excited that we can hardly contain ourselves. It is time for handshakes all around and picture time. Then Tjokkie goes after the truck while Johann explains how we will get this huge animal up on the truck. One of my first bosses, a Mr. Alan Moose, told me “that what your brain does not do your back has to”. Well Johann’s brain must be working just fine because he has this down to an art form. First Tjokkie backs the truck up almost to the kudu. Then Johann strips cable off of the wench on the front of the truck, then it goes across the pulley on the push bar then across the pulley on the roll bar and then to the kudu. Now all we have to do is wench the kudu across the truck’s lift gate and into the truck. An idea so simple that I never would have thought of it. I would have struggled trying to push the thing into the truck. When we get back to camp I decide to get cleaned up while Johann takes care of overseeing the care of my trophies. I would have thought it impossible to improve on the day, but when I get to the fire pit Vera meets me with a cold beverage of choice and a big smile. She is as genuinely excited as I am about the day and wants to hear the whole story of the day. Before I get done with the story and my second beverage, Johann returns and informs me that the trophies are in good hands and that the warthog is indeed a gold medal and the kudu, even though old and worn down, will still make silver. Now for more good news; we are having warthog ribs for supper. I absolutely love ribs so the opportunity to try warthog is most appealing. After an absolutely outstanding dinner we return to the fire pit (now my favourite place in camp) for an after dinner glass of wine and good conversation. About 10:00 pm we hear an awful noise coming from the bush just outside of camp that no one can immediately identify. After the second time we hear it Johann decides that it is an animal in distress. That does not immediately bother me, that is, until I see Johann grab his rifle and the big flashlight. We decide to jump into the truck so that we can cover more ground quickly and head into the bush in the dark of night. After 10-15 minutes of searching we can no longer hear anything nor have we yet to see anything. When we get back to the fire Johann tells me that it was probably a leopard killing a kudu calf. This was close, right outside of camp. Talk about another adrenalin rush, what a day. We decide to investigate further tomorrow and turn in for the night. I hope I can sleep. Three major doses of adrenalin in one day. If tomorrow is any more exciting, I don’t know if I can stand it. Lazy day at camp, I get up about 7:30, dress and make my way to the dining tent. Breakfast is not quite ready yet so I take some pictures to pass the time. I notice tapping on something with a strange hammer; it is an ostrich egg. We are having a “farmer’s omelet” for breakfast. It includes: ostrich egg, potatoes, bacon, sausage, onions, and cheese. After breakfast Johann and I try to figure out what is wrong with my Mauser. We take the scope completely off and remount it. Then I do some sanding to free float the barrel. We put everything back together and it looks good. We will try it out after lunch. While I was sanding, Johann made himself a C.O.A.L. gauge. That is a “combined over all length gauge”. It is used to determine an exact bullet length for a specific rifle. His resourcefulness never ceases to amaze me. We then set about determining the COAL for his new rifle, a 270 WIN. I have done this on most of my rifles so it should be easy, right? Wrong, all of his load books are in metric and mine are in inches. Well being a typical American I never learned the metric system like I should have so we ended up converting to inches so I could do the calculations from my book and then convert back to metric so he could use his calipers. Fun huh? Anyway everything should work out. After lunch we head to the range and the Mauser is still shooting all over the place. As we study the situation Johann notices some space between the receiver and the stock. In only 5 days, the dry African climate has shrunk the stock so that the receiver has room to move. This amazes me; all of my rifles are kept in a climate controlled vault with a fairly low humidity, but to no avail. I have learned my lesson. I will never come back to Africa without my rifles being glass bedded. Next we head off to go guinea foul hunting and I am concerned when Johann comes out with a .22 instead of a shotgun. He then proceeds to explain that you have to shoot them in the head or neck so that no meat will be lost. Sounds good in theory and I am willing to try almost anything once so off we go. We take the truck and head for the waterholes where we find a group of unsuspecting guinea foul. I lay the rifle across the fold down windscreen, look thru the scope and squeeze off a shot. Miracle upon miracle I connect on the first shot. Feeling pretty pleased with myself I got brought back to reality quickly when it took me 6 shots to get another. We started taking turns and we got 6 birds in all. What a ball of fun. I can’t wait to do this again. When we get back I have time for a beer before dinner. I love to wind down this way. For dinner Vera has made chicken with peaches and for sides we have broccoli with cheese and rice. It is all very good. After dinner it is back to the fire pit with a glass of wine for more conversation and stories. A fellow (or gal) could get real used to this. The moon is almost full; this means that the animals can see to feed at night and not have to move around as much during the day. This is exactly what is happening. We hunted hard all morning and saw very little. Johann and Tjokkie even climbed “Scout Mountain” to look for animals. They were just not moving. We tried a couple more spots with no success then gave up and went to lunch. After lunch I thought our luck had changed. We spotted three gemsboks coming down the road toward us. We thought that they would either come toward the water or a mineral block that the cattle were using. We backed the truck up and parked it out of sight, and then we got into position so that we could see both of the possible stops. We sat up and started to wait, and wait, and wait. Wouldn’t you know i, the gemsbok had other plans and never showed themselves. We decided to drive to the back-side of Scout Mountain where Johann had seen gemsbok two days earlier. We looked up the roads and fence rows and saw nothing. Johann suggested that we walk into the interior to see if we could spot something. The only thing we saw was a cull animal and I think that I scared it off with my stomach growling. We hiked and hunted for over an hour and got back to the truck with only a few minutes of light left. As soon as we drove a little bit and the last of the shooting light was gone it was if someone flipped a switch; the gemsboks were coming out of everywhere. It was if they knew that it was too dark for me to shoot and they were safe. We plan to drive into town tomorrow to meet with the taxidermist and pick up some supplies. I hope the gemsbok think that I have given up on them and let their guard down. We will try to sneak up on them tomorrow night. Got an extra hour’s sleep this morning because Johann took me into town to check out the local taxidermist shops. On the way to the gate we saw two good gemsbok bulls. They evidently knew that we did not have our guns and I swear that they were laughing at us when we went by. Before we stopped at the taxidermist, we stopped to meet with André. André is Johann’s friend and a machinist, who just happens to build silencers. With all of the gun restrictions in Africa I figured that silencers would be illegal, but they are not. Johann is having one put on his varmint rifle. After I stopped to think about it for a while this makes perfect sense, without all of the noise he can do more shooting and get rid of more varmints. I wish he had already had it done so I could try it. The taxidermists were very interesting. After we got to see the showrooms I got to go back to the work / processing room. You could see how the skulls and horns were being prepared and then the hides. We saw various stages of work and a lot of completed mounts. Both shops were nice but one seemed to pay more attention to detail and that is the one I chose. After we left the taxidermists we stopped for a few supplies, including some excellent South African wine (it is amazing how we keep running out). The grocery store reminds me of the ones at home, complete with a deli. I guess some things are the same everywhere. We load up with supplies and soon we are on the way back to camp for lunch. After lunch and a short nap we are off after gemsbok, first stop Scout Mountain. I let Johann and Tjokkie climb without me so that we can save time. It was not long before they came down after spotting two groups for us to go after. By the way, I finally was experienced enough to spot a gemsbok myself, but since it was a single we decided to go after the groups. Soon we were in the bush stalking the first group. They were feeding in some trees and brush so it was difficult to get a good look, but there was one with at least 35″ horns. He was out of my comfortable shooting range so we stalked closer and were able to close the range to 170 yards and I started thinking about the shot. It would have been difficult to get any closer to see if the others were any larger so I decided to pass, and we headed off toward the other group. We had not gone to far when we started to encounter other animals, the first were warthogs. They would start to move off and then turn around and come right back. I finally decided to take a picture so naturally they moved out of range. Next we came across eland. It is hard to imagine how big they are with out seeing them in person. These things are huge. We had to be really careful because they spook easy and if they spook they could spook the gemsbok. We finally got close enough to the gemsbok to get a better look; one had a magnificent set of horns that Johann said should go 40″. Our luck was still holding however because we had not been watching very long when we figured out that he was a she and had a calf with her. We watched for a few minutes more and started heading back to camp as the last of the shooting light started to fade. Back in camp Johann educated me a little more on field estimating gemsbok horns. The females can actually have longer horns than the males although they are normally smaller in diameter and less symmetrical. The male horns have more mass and are generally pretty even. Oh well, tomorrow is another day and another adventure. Up at 5:30 breakfast at 6:00 and on the trail at 6:20, I suddenly realize that this is my next to last day to hunt and I still have not gotten a gemsbok. Johann says not to worry that with two full days left that we still have lots of time. We do not start out at Scout Mountain; instead we tried some waterholes and brush on the camp side of the property. We tried sneaking around corners and fence rows to do some glassing but the only thing we saw was a jackal. Tjokkie even climbed a tower but nothing was moving. It looks like the full moon and night feeding are going to give us trouble. If everything is feeding at night how are we going to find them during the day? After lunch and a nap we head back to Scout Mountain to do some glassing. We purposely waited later than normal to see if we could catch the animals moving and it seems to have worked. The only possible problem is we still have to drive closer, make the stalk, get the shot, and load the animal all before dark. We take off thru the bush walking fast and trying to dodge other animals, it seems like we have walked for miles and have yet to see our gemsbok. I am beginning to wonder if the gemsbok we saw earlier were scared off by something or if they just wondered off. I am still wondering and not paying enough attention to the situation at hand when Johann freezes and motions for Tjokkie and me to do the same. There about 250 yards away are our gemsbok and they are oblivious to our presence. At this range I am outside of my comfort zone and we have to get closer. We move around to our right a little bit and then we can drop low and move forward about 75 yards to a clump of trees and brush, a perfect place of concealment and close enough to shoot from. I get there and set up and then wouldn’t you know it, the gemsbok move into some cover and I can’t get a shot. Then I notice a shooting lane to the right. Now I just have to let the animals get to the opening. One by one the gemsboks start to move into the shooting lane but they have changed order, Johann has to look thru his binoculars and sizes them up again. The one we want finally steps into the opening and I wait for him to stop. Seconds after he stops I squeeze of a shot and all heck breaks loose. The gemsbok (the one I shot at included) all take off at top speed, within a few seconds they are all out of sight. I slowly start to realize that I have not made a good shot and the night has just begun. We move up to where the gemsboks were and start looking for sign. Johann and I start looking for blood and Tjokkie starts picking up the trail of the group of animals that took off. Tjokkie finds his trail but Johann and I find nothing, no blood, no hair, no anything. We look until dark and then we head back to camp for rest and dinner. Over dinner and around the fire Johann and I talk our way through the set up and shot. I am convinced that I made a good shot and that the animal should have been hit hard enough to go down and stay down. Soon we decide to change the topic and go back and look again tomorrow morning. The rest of the evening goes by pleasantly, but my lost gemsbok, and my bad shot is not far from my thoughts. Soon fatigue takes over and I decide to go to bed early, I have a long day of tracking ahead of me tomorrow and I want to be rested. It is barely daybreak when we pull out to look for the gemsbok. It has been a tossing and turning kind of night, but at least I have come to terms with the events of the night before. We arrive back at the location and go back to the place I took the shot and then retrace our steps to look for sign. I try to guide Tjokkie and Johann to the spot where the gemsbok stood to start the tracking. I say “try” because they remember it much better than I do. Tjokkie starts at the point of the shot while Johann takes off to look ahead to see if he can see anything. I attempt to help Tjokkie (mostly by staying out of his way) to find blood sign and to mark course changes of the running gemsbok. We look for several hours and find nothing but hoof prints. Johann suggests going back to the starting point and look again; the only thing we find is a small single gunshot branch. Johann finally concludes that I hit the branch and missed the gemsbok. I question that, but after I think about it for a while I give in and accept his conclusion. After all we tracked the group for a considerable way and found no blood or body. If I had connected there would have been blood somewhere. After reaching his conclusion Johann ask if I want to go after another gemsbok, so you guessed it, we climbed Scout Mountain one more time. I decided not to climb to the top and let Johann and Tjokkie do the looking. This was probably a good thing because it was not long at all until they came back down and told me that there were three or four gemsbok at the foot of the mountain and that we had to hurry if I wanted a shot. I moved as quickly as possible across the loose rock formation trying to keep up with Johann. If we were in the U.S. or Canada I would swear Johann was part mountain goat because he literally ran across the loose rocks to get into position. I finally managed to catch up and see the gemsbok. I take a cap and rest my rifle on it and wait for Johann to tell me if one is a shooter or not. Johann finds me a shooter and I ready myself to shoot. He lasers the distance and tells me that it is 185 yards. I make the calculations adjust my point of aim and shoot. The gemsbok goes down, then pops up runs about 50 yards and lays back down I can just see his head sticking out beyond a clump of trees. I thing about taking another shot but the only shot is at his head, his body is completely concealed by trees and bush. I talk myself out of another shot because it could ruin the mount and if the animal laid back down it was probably a fatal hit. We start to wait and nothing happens, the longer we wait the more nervous I get. It has been five to 6 minutes; why has this animal not died and fallen the rest of the way over. Then the impossible happens. The gemsbok stands and takes off like the devil himself is chasing him. I am too stunned to even move much less try another shot and I lose sight of the gemsbok in the brush. I look over and Tjokkie is following him and said he stopped with some other gemsbok about 600 yds away. Before we can decide what to do they are off and running again. This time Tjokkie watches them for over a mile until they disappear around the left side of the mountain. We scratch our heads for a while trying to figure out what has just happened. Johann decides to go down to where the gemsbok was standing to see what he could find, absolutely nothing, no blood, nothing. This can’t be happening again not twice in as many days. I decide to go down and look where the gemsbok disappeared under some trees to see if by chance he was still there and it was only his companions that ran around the mountain, but no luck there either. To make a long story short we looked for hours from the point of impact to the spot where he lay down to where he disappeared under the trees. We even climbed back up to where the shot was taken to get our bearings and that did not help. Johann finally found a single drop of blood on a rock and that was it. I was too disappointed to try again so we headed back to camp to pack. As soon as we got back to camp Johann said come with me and we went to the rifle range. We set the bench back up and I fired a few shots, the first was high and right and the second was higher and right. Somewhere, somehow, my scope had gotten considerably off. This made me feel a little better, but I was still beating myself up about the whole thing. Johann admonished me a while about my choice in scopes then he smiled and said “you know this gives you a built in excuse to come back and try again”. After I thought about it for a second I decided he was right and I could come back to get my gemsbok and a few other trophies. That night around dinner and the fire the conversation was lively and filled with the successes of the trip as well as plans for future trips. My mind was filled with the possibilities of who I could bring back with me and the adventures we could have. It was the perfect end to a great trip. I was glad that I had packed before dinner so that I could spend as much time as I could with Johann and Vera around the fire. I have really gotten used to the evening ritual of after dinner drinks and conversation around the fire. Tomorrow I must return home to rushed dinners and getting evening chores done. Then sitting in front of the television and drifting off to sleep. At least I can dream of coming back to Africa and more adventures with Johann and Tjokkie. I have to get up early today so I can get started on my way back home. I have to find something to take back to my wife and kids and we have to stop at the Namibia Professional Hunting Association (NAPHA) to pick up my medals and certificates. Our first stop was the local craft market; it was too bad that I did not have more time to spend there because the place was amazing. The quality of the items there was amazing to me, for hand made items and the variety was simply phenomenal. There was everything from jewelry, to furniture, to carved animals and murals. I had to select just the right combination of items so that my family would not see it as a bribe and that they would want me to come back to bring more. The problem was that I had to do this in 30 minutes or less. After shopping and some translation help from Johann, I had picked some jewelry for my wife and two girls, a wall carving to display in the house, and a scrimshawed salt and pepper set supposedly made from buffalo bone for me. With the shopping accomplished we were off to the offices of NAPHA. Vera had phoned in my information and they were going to let me take my certificates and medals home with me. I wanted to have them to take and show off and so that they could not get lost in transit. I also found a patch for my jacket and a baseball cap. The offices were really nice and there were some terrific trophies on display, I must spend some more time there in my next trip. It is only a short drive to the airport and we have time so we take our time on the last leg of my trip with Johann. After we get to the airport the process of checking my guns in is fast and painless. The U.S. and a few others could learn a few things from the Namibian government on airport security and hunters traveling with firearms. All of the paperwork is complete and I tell Johann goodbye and that I plan to see him next year, then I go through the security checkpoint. The trip from Windhoek to Johannesburg is short and painless, and I should have known that it was too good to be true. I arrived in Johannesburg, found my transfer gate and even had time to rest for a while, and then it happened. I got caught up in the great shampoo scare. It seems that some terrorist figured out how to make a bomb from liquids that could be assembled on the plane. While I appreciate the airline taking great pains to secure my safety, I wish that they had the forethought to start to screen all 400-500 passengers a little more than 20 minutes before take off. Needless to say that started a chain reaction of delays that stayed with me the whole trip. I was still waiting in line to claim my baggage in order to clear customs when my connecting flight left. That event meant I had to go thru the regular check in with my guns at Dulles airport on a “Code Red” day. I figured that I was done for. That I would be lost forever in a sea of red tape and security purgatory, but then an amazing thing happened, I got pulled out of the impossibly long line and got put in a short one. The only trade off was that I was now in the super security check line and had screening procedures that I still do not know what they were looking for. After multiple searches for multiple things I was finally allowed to check my luggage and head for my departure gate and grab some non-airline food. As I sat eating it had time to sink in I was almost home after having an incredible adventure and making what I hope to be life long friends. Africa, at least the little corner in Namibia that I saw, is a beautiful land with excitement and the unknown around every corner. I can only wonder when I will be able to return, soon I hope. The flight back to Greensboro was uneventful except for the fact that my darling wife took off work and came to pick me up. She brought my daughters with her and it made the end of my adventure a little more bearable to see their smiling faces and get hugs all around. It was 36 hours going and over 40 hours coming back. Would I do it again? I’ve already left.